Have you ever wondered what Snow White’s style would be like if she was a modern day teenager? Well, now there is no longer a need to wonder. We’ve taken it upon ourselves to solve this mystery and we think we have the answer. Check out this lovely Teen Snow White Costume. If you’re ready to go on a modern day fairy tale adventure then slip into this cute variation of Snow White’s outfit. Before you know it, you’ll run into charming princes, dwarves by the dozen, and jealous sorceresses! Real exciting stuff, so you’ll want to make sure you’re fully prepared for all of it this Halloween. This costume comes with most of what you need, a dress to die for, a headband with an adorable red bow, and of course, a brooch. What’s a fairy tale without a brooch? Nothing, that’s what. Now, we would just suggest grabbing a cute pair of practical footwear, there is always so much walking in these storybook adventures. Also, maybe carry around an apple in case you get hungry. You can never trust produce that you receive from seemly-helpful elderly women… they always just want to steal your youth. So be leery of that! 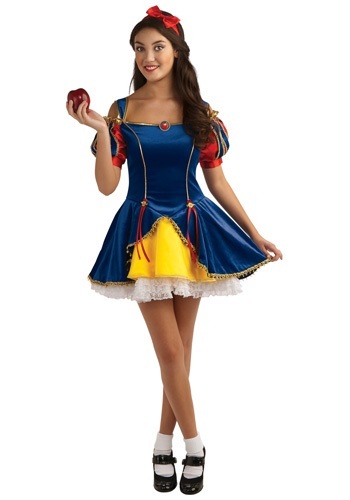 Get your very own fairytale kicked off the right way with this beautiful Teen Snow White Costume. When you get a few friends to dress up as some helpful dwarves and a prince, you’ll be ready for a truly magical Halloween!